"It's merely attraction." Her voice was too faint, too unsteady. "Attraction does not mean that we are..."
"Meant for each other," he supplied,low and dry. "Yes, that." She raised her chin and pinned him with a quelling look. "Attraction is not so precious. It happens all the time." Haven't read historical in a while and this one is that and paranormal. So, it's different. And interesting. More later. Because in her dreams the huge man with black hair was looking for someone--searching tirelessly. And somehow she knew that the person he was searching for was her. Then last night, he'd found her. Liv still remembered sitting bolt upright in bed at four in the morning, her hand pressed between her breasts as if to still her pounding heart. The scene in the dream had showed the mysterious dark man staring right into her eyes and he'd spoken only one word. This one is sci-fi, but it seems to have a shifter feel, and I'm enjoying it so far. I have high hopes! Sometimes you need a good ole historical, with a side of paranorm. Hopefully you like it. I am loving the Mine teaser! OOoh nice teasers! I read Soulbound last week and LOVED it!! Hope you're enjoying it too! The other one is new to me but hope you're enjoying it as well Jess! Love those teasers! I hadn't heard much about either of those books, but now I'm curious. Soulbound looks good! 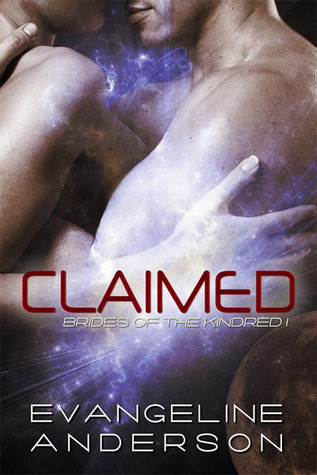 I've read Claimed before but it's been a couple years ago now.